Tony Jones said it! It's nothing new, not at all. But I've been saying it and I've been waiting for someone else to say it... Love and Justice are not in competition! The original Christian understanding of love and salvation are shockingly different from what we are often presented with in non-Orthodox Christian churches. First of all: God is love--even before He creates; His love is not just and expression of His will towards creation, or simply an attribute, but rather God loves by nature--because of who He is. Love is intrinsic to His Unknowable Essence." "...God's love is not a characteristic of God. For example, maybe you've heard someone say, 'sure God is loving, but his love is balanced with his justice.' Or, 'without justice, love is not possible.' These statements talk of God's love as an attribute of God... It's not an aspect of God's being, it is God's very being." Now, this may be a description of the Eastern Orthodox perspective but I believe it should be the standard mode of operation in all Christian circles. After all, the only time in Scripture when someone takes the risk putting God into a word, it's "God is Love" (1 John 4:8 and 4:16). 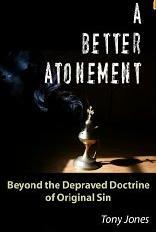 From this seemingly obvious starting point, many of our formerly casual convictions about heaven and hell and the atonement are called into question and maybe aren't so obvious anymore. It doesn't mean that everything we know is wrong, it just means that some of the ideas we sometimes take for granted actually have some explaining to do. God is love. Justice may be an expression of God, indeed an expression of love, but love is God's very essence. Thanks for saying it, Tony Jones!